I do like things that do more than one job. I like multi tools for example and I especially like things that do more than one job well. I’m also into things that save space and weight in the caravan, and I have been looking round for ‘stuff’ that does both. You know those days when you have a cup of coffee in one hand, mouse in the other and you are looking out of the office window at the rain wishing you were staring out of the caravan window instead? Thoughts turn to Googling and by one of those tricks that Google has of finding things you never knew you wanted and completely off the subject I was Googling in the first place found me reading about OLPRO. 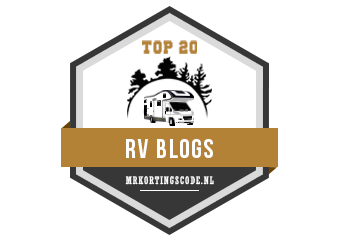 OLPRO is a company that may not be as well-known to caravanners as it is to tenters for its top notch range of tents – I suspect this is changing rapidly though! It’s a family firm started in 2011 and it design’s and supplies equipment for the outdoor leisure market. Amongst other caravanning equipment in their catalogue they also supply a range of chemical products specifically for caravans and motorhomes. When we bought our caravan, we received two small complimentary bottles of toilet chemicals courtesy of Thetford. One pink for the top tank and the other blue for the cassette. Not knowing much back then and as they were free, we used them for our first few trips. However I soon discovered the problem with the blue chemical was it contained formaldehyde and you shouldn’t use it on sites that had septic tanks as it could effectively kill the septic tank. So we swapped to a green chemical from another company and in time also swapped to their pink for the top tank. However it always seemed we used these at different rates and just to make sure we never ran out we ended up always carrying a part used one of each plus a full one. It also crossed my mind why do we have two chemicals? Now back to my Googling! 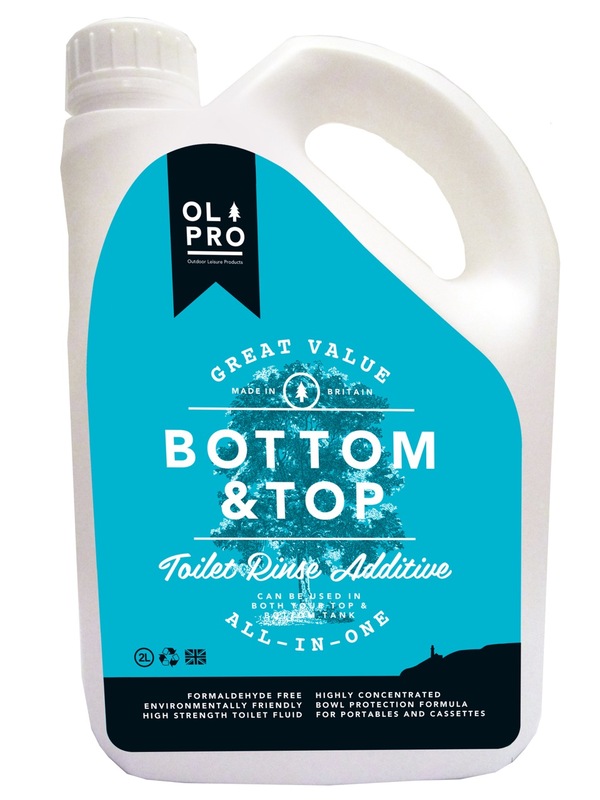 On the OLPRO website I read about Bottom & Top all-in-one toilet additive which as the name indicates is one product for the cassette and top tank. So on a recent trip to Chatsworth CC site we had chance to give it a try. Although it is formaldehyde free it is blue so just incase the Elsan Police are about you might have to explain it’s OK to use with septic tanks. The smell for me is much improved over the sweet bubble gum smell of the pink solution we were using. This is more of a disinfectant meets air freshener smell and actually not bad at all. Sue thought it smelt ‘fresh’ (what ever that smells like!). As a product it works well and the dilution recommended on the container was easy… 100 ml to the bottom tank (up to 20 litres capacity) and 100 ml to the top tank. That would give us around 40 ‘doses’ out of the 2 litre container, which for the price wasn’t too shabby. Now I don’t have 4 containers of loo chemicals in the front locker. (Note to self… get a 100 ml measuring container to leave in the caravan). One thing that did occur to me though was I could put some of the 10:1 diluted solution in the waste hog before packing it away for the next trip and store it with some of the solution inside, so that next time we use it it should be clean and fresh. I guess you could also put a drop of the diluted solution in your aquaroll when packing up too to keep that fresh – I think I’d rinse it out before using next time though. The last product I gave a billy whizz, well they do say everything comes in threes was the Inside and Out. It wasn’t because I didn’t like what I was using it was because of the cost. I had been using an Autoglym car product for washing the caravan (I had some in the workshop for cleaning the Freelander) and I had been using “OneDryWash” a waterless wash product which I found pretty good for on site cleaning. That was until I realised in 12 months I’d used 4 of them at around £13 a time. Over £50 in twelve months had me searching for something else a bit cheaper to use. That’s what I was Googling for in the first place by the way! Now then, I normally always have a OneDryWash… and a polish… and some wheel cleaner… and a black streak remover and some other cleaning stuff in a box in the front locker. This product says it can do it all…. as well as replacing some of the products Sue uses inside the van too. Now either this was snake oil or I’d discovered the next best thing to sliced bread. On the web site for Inside and Out it states…. This unique formula replaces the need for 7 different products. Inside & Out cleans every part of any caravan or motorhome. This 2 litre bottle will keep going and going. Use instead of Caravan Cleaner, Black Streak Remover, Glass Cleaner, Wheel Cleaner, Bathroom Cleaner, Hard Surface Cleaner & Fabric Cleaner. 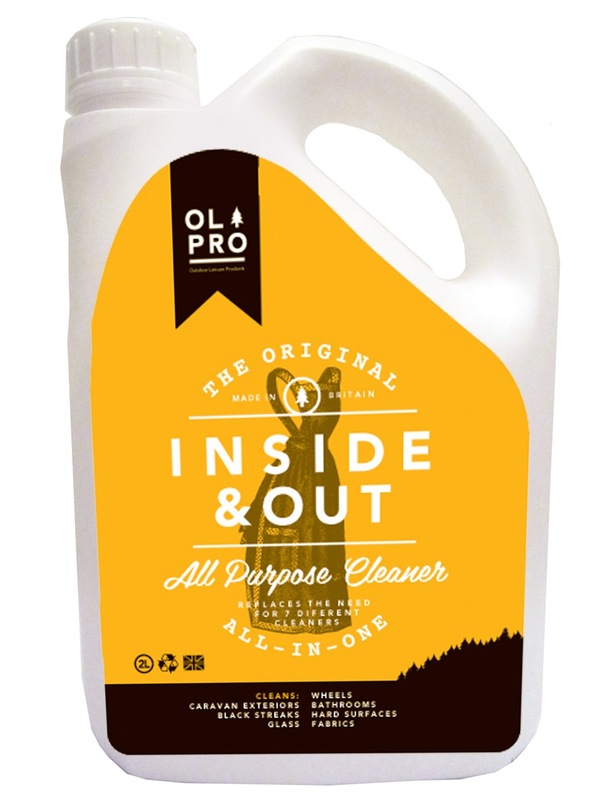 Inside & Out is a multi-purpose cleaner suitable for all hard surfaces and soft fabric inside caravans and motorhomes. Will not leave any white residues and does not damage plastic or metal fittings. The original caravan all in one. That is a HUGE statement to live up to! Being a bit cautious about cleaning the caravan with anything new (well new to me) so a couple of days before we set off for Chatsworth I tackled the Freelander first. Being all black its worse than my black trousers are at collecting cat hairs for collecting dirt. The directions say as a caravan cleaner dilute 100 ml into 5 litres of water. After hosing off the dust and worst of the grime with the hose pipe I used my normal long-handled soft brush and gave the Freelander a good scrub down using the diluted solution. I can’t say it was better than my normal Autoglym car shampoo, but it wasn’t any worse that’s for sure and it was half the price! One thing I notices is it seems to have some form of ‘wetting’ agent in it as my rinse water (a fine spray on the hose pipe) started to bead almost immediately. This should be good for stopping the watermarks when you wash the car or caravan in warm weather. It did rinse off easier and there was no sign of the white bloom on any of the black plastic trim. What was handy was I didn’t have to go over the glass with my normal glass cleaner. It also seemed to do a pretty good job of cleaning the alloy wheels – not as good as Wonder Wheels, but that is a whole different product. On the label it states to use as a Bathroom Cleaner dilute 100 ml in 1 litre of water… and the same to use it as a Hard Surface Cleaner… and funnily enough exactly the same dilution as a Fabric Cleaner. Now I just happen to have (Oh I do hope Sue isn’t reading this!) a few of the empty containers with the spray trigger that I’m constantly being told “it’s not worth saving put it in the recycling bin” spare in the workshop, so I have mixed up a solution and filled one of the containers – I think they now call this ‘repurposing’. 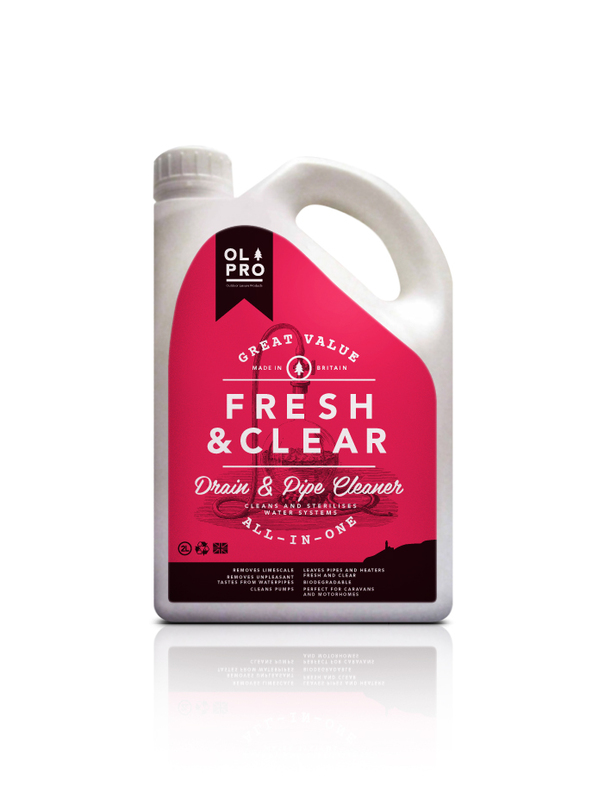 Note: OLPRO do have a waterless wash range of chemicals –link here, but I’m not trying to use Inside and Out as a direct replacement for my current waterless wash product, just as an all round cleaner that’s a bit more cost effective. If you want some micro-fibre cloths and are a COSTCO member, look out for the packs of 30 yellow micro-fibre cloths. I have been using them for about 18 months and when I have used them all I simply do is put them in the washing machine – under Sue’s supervision of course and they are good to go again. We haven’t used it in ernest for cleaning the outside of the caravan as the weather hasn’t co-operated and we’ve not been able to do the start of season ‘shampoo and set’ on the van. However a quick test on various hard surfaces around the house it seemed to work well enough. Sue no doubt will give it a through work out when we do the full caravan spring clean before our next outing. I guess the same variety of cleaning can be done by individual products, but for me, the fact one container if this stuff in the caravan can take care of all the general touring and on site cleaning both inside and out ticks my boxes as a useful ‘multitool’ and works for me. So to sum up… three products that are like a collection of Swiss Army tools, they do lots of things – do they do them all as well? Only time will tell, but on first impressions it would seem so. I’ll report back soon on how we are getting on with them. I do know we have some spare room in the front locker now as I have reduced my container count from 8 to 3. The other plus point is the cost… I recon we will save around £50 to £60 on the cleaning and disposable fluids over 12 months when compared to what we were using… that means we have a ‘free’ weekend away… or we could invest in some of the jazzy melamine place settings OLPRO sell… Hmm decisions decisions! OLPRO have an on-line retail store and sell through a large network of retail outlets. PPS If you are going to the Caravan & Camping Show at the NEC (18 to 23 Feb) OLPRO are on stand 5300. Stop by and say Hi and tell them I sent you! Not sure which model toilet you have, but mine has a measuring cup built into the dump cap, like this one – http://www.thethetfordcentre.co.uk/magento/thetford/tf/c2-c4-dump-cap-with-measuring-cup.html – it’s not actually marked at 100ml, but you could graduate it yourself. You know, you see something all the time but you don’t notice things! DOh… I never thought of the screw cap on the cassette darn it. Although I don’t think I would like to use that to measure out fluid to put into the top tank. Hi Simon I don’t know if your cassette is the same as mine but underneath our tank is a space for 4 Theford 400ml bottles under a cover that the tank slides on. All I do is refill these (2 for the top tank 2 for the bottom tank) before a trip, the bottles have measuring windows on them, makes the job simple on site with everything together in the casette housing. Keep up the good work Simon, your doing a fantastic job with this blog! To be honest I have never looked! I don’t think there is any space under the floor of the Thetford Cassette as this would be below the floor level of the caravan, but I will check.